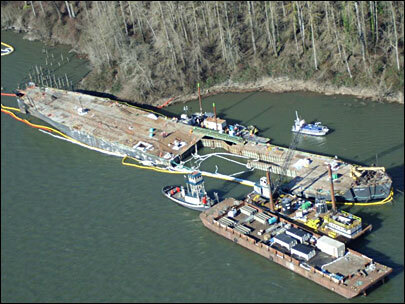 On January 27th, 2011, authorities responded to an oil sheen extending 14 miles on the Columbia River, quickly tracing it to an illegal scrap metal salvage near Camas, Wash. So much steel had been removed from the aging ship's hull that its back had broken and inner compartments were exposed to the river's currents. Davy Crockett Unified Response consisted of the Coast Guard, Wash. Dept. of Ecology (DOE) and Ore. Dept. of Environmental Quality (DEQ), a rehearsed and practiced Pacific Northwest partnership. The 431-foot flat-deck barge Davy Crockett, a repurposed 1940s Navy liberty ship, was found leaking a cocktail of bunker fuel and other harmful substances into the environment, from compartments not readily accessible prior to the salvage operation. It was a sleeping giant of environmental blights, a WWII time capsule reminding us that our past maritime industrial practices are not gone and forgotten. The Davy Crockett was sold and refitted as a flat-deck barge for commercial use following its military service life. Changing owners repeatedly, it found its resting place near the bank of the Columbia River, a body of water that reaches the sea where it separates the Wash. and Ore. border. "Due to the owners attempt to scrap the vessel in the Columbia River, we were left with a vessel who's keel was broken and who's inner tanks were open to the Columbia River," said Coast Guard Capt. Daniel LeBlanc, Commander of Marine Safety Unit Portland and Federal On Scene Coordinator (FOSC) of the Davy Crockett Unified Response. As the Coast Guard moved forward with investigations and possible prosecutions, the disaster required immediate management and response. In situations where a responsible party has not been definitively or legally established, or a dispute would delay funding of a pollution response, the Oil Spill Liability Trust Fund is used to fund a cleanup. This emergency fund is managed by the National Pollution Funds Center. The cleanup effort began by ballasting the vessel. "Safety of workers was the main factor considered in the decision to ballast the stern section. After consulting with the Coast Guard Salvage and Environmental Response Team (SERT) and a contracted naval architect firm, the unified command concluded that the stress upon the hull/keel near the point where the stern and mid sections bent in opposite directions posed an unacceptable safety risk to divers," said LeBlanc. He explained, "the fear was that the hull/keel would fracture at the stress points and cause catastrophic movement of the sections, thereby causing diver injuries or death. The stern section was ballasted to re-align it with the mid section, thus relieving the stress on the hull/keel." The ballasting lowered the strongly upward pointing stern by 17 feet. In February of 2011, Adm. Robert Papp, Commandant of the Coast Guard, authorized the destruction of the Davy Crockett to address the threat of continued hazardous discharges into the river. An initial plan was to return watertight integrity to both the bow and stern sections separately, and then refloat them for separate removal by tug boats. Later, a plan was adopted to build a new containment system and dismantle the vessel on site. The problem faced with this solution was that absorbent boom surrounding the vessel until now would not contain the potentially high volume of pollutants released as inner compartments became more exposed to water. A cofferdam was determined to be the most certain method for containment. In essence, a cofferdam is a system of tall interlocking metal plates driven into the sea floor to encircle the vessel. The steel cofferdam was then lined with a protective material curtain that prevented oil, pollutants and silt from escaping and entering the river environment. The completion of the cofferdam successfully produced an area of total containment. "The cofferdam is not a common solution used in response to pollution threats from vessels. In this particular case, the responders were faced with a partially salvaged and structurally crippled vessel that was leaking oil and threatening to spill all of its oil into a pristine river environment. When the options to utilize local drydocks became unattainable to the unified command, the cofferdam (and the impermeable barrier which lined the inside) became the best option to protect the environment during the in-situ deconstruction work," said LeBlanc. "The failed salvage attempt by the owner left a vessel whose entire mid section was gone (above and below the waterline) and whose inner tanks were virtually open to the river. Had the vessel's hull been intact below the waterline and structurally sound, there would have been no practical need to construct the cofferdam," said LeBlanc. Civilian contractors were employed to construct the cofferdam as well as conduct the dismantling work, this labor requiring a crew of very diverse specialists. The vessel was disassembled stern first, frame by frame. Welders cut the deck as teams of salvage divers spent two to three hour shifts rigging and cutting sections beneath the waterline and within flooded compartments. Coast Guard and civilian safety observers maintained a presence throughout the operation. The larger stern section was refloated before it was taken apart, using the opposing weight of buoyant and flooded compartments to help break off large sections, which were then transferred to a decontamination barge. Carefully pressure washed sections were then moved to another barge to be hauled away and water was captured for treatment. Next, the bow was dismantled while it rest on the bottom, and processed through a similar decontamination. Approximately 3.5 million pounds of steel were removed. Additionally, more than 38,397 gallons of bunker fuel, 4,850 pounds of asbestos and more than 1.6 million gallons of oily water were removed. It was an eight month pollution removal effort. The final section of the vessel was removed on August 25th, 2011. "This project will affect the manner in which we deal with derelict vessels," said LeBlanc. The project was completed when the cofferdam was removed on December 8th, with a final cost of approximately $22 million. "From a technical perspective, the project has revealed several lessons learned that could be implemented during future responses. From an overarching perspective the project led to the creation of a regional Derelict Vessel Task Force. This task force meets regularly to discuss, plan, and establish protocols for a litany of issues related to vessels that pose an environmental risk," said LeBlanc. Many aging ships have come to rest in American rivers and waterways. Some of these benign, others may harbor unknown threats. Owners purchase them with dreams of restoration or salvage, but end up placed on the permanent to-do list. Like the Davy Crockett, some of these vessels contain too much pollution to salvage profitably, if done within federal and state environmental law. Forgotten and unmaintained, these vessels can become an instant emergency, sleeping giants difficult to identify amid genuine restoration projects and with the potential to cause millions of dollars in environmental damage.